Electric-car startup Aptera scores an undisclosed amount of funding to start manufacturing of its first vehicles this year, while Silicon Valley startup Project Better Place plans to bring Denmark a nationwide system of electric cars. Aptera has raised enough money to manufacture and support its Typ-1, a futuristic-looking three-wheeled electric vehicle, and is on track to begin manufacturing by the end of this year, the company said in a newsletter released Wednesday. 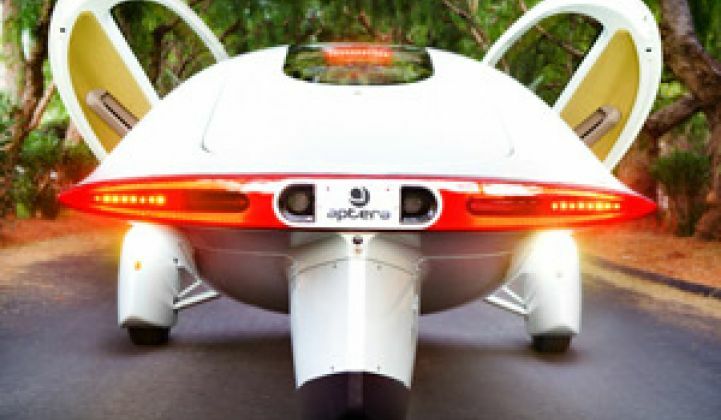 The company, which is backed by Idealab and Esenjay Investments, in November said it was raising funding to begin manufacturing and would begin delivering its vehicles this year (see Aptera Launches 3-Wheeler and Mr. Spock’s New Ride). In the newsletter, Aptera didn’t say how much it had raised, how long it would take to build the plant or how many vehicles it would be able to produce there. The company also didn’t immediately return calls requesting more information. But the Carlsbad, Calif.-based company said the plan is to hire "a bunch" of new people, move into a larger facility, conduct advanced crash testing, refine its manufacturing process, begin "mass production" of the vehicles, build the first Aptera store and deliver the first car. The newsletter didn’t disclose the location of the new facility, but in a YouTube video, Aptera CEO and founder Steve Fambro said the company would be moving in the next few weeks. Fambro also said vehicle sales will start in Southern California and then roll out in Menlo Park, Calif., and the rest of the Bay Area. The company could be setting itself up to challenge Tesla Motors, although the cars are very different, as Tesla Motors’ first store also is in Menlo Park and its second store is opening in Los Angeles. Tesla delivered its first electric sports car in February and began mass production earlier this month (see First Tesla Production Roadster Arrives and Tesla Begins ’Regular Production’ of Roadsters). 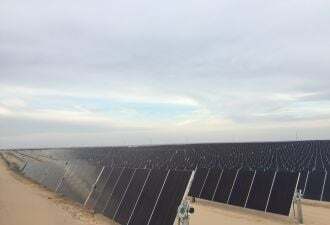 "We have enough business in California to keep us very busy," Fambro said in the YouTube video. The company is still contemplating its next move outside of the Golden State. Aptera plans to produce two versions of its Typ-1 -- an all-electric and a hybrid model -- that will cost around $30,000 each (click here for a company-guided tour). The company claims its all-electric model will travel about 120 miles before needing to recharge at a standard outlet, while the hybrid will get more than 300 miles per gallon. So far, more than 1,200 customers have placed refundable deposits for the Typ-1, according to the Union-Tribune. But despite Aptera’s advances and Tesla’s production, the electric vehicle industry still faces challenges, such as a smaller range -- that is, how many miles the cars can drive before a recharge -- than gasoline vehicles and expensive batteries that take hours to charge. Companies such as Project Better Place, which plans to lease removable batteries for electric cars and build a network of battery-charging and replacement centers around the globe, hope to help address the charging challenges. On Thursday, Project Better Place said it’s teaming up with Danish utility Dong Energy and the Renault-Nissan Alliance to supply Denmark with a network of all-electric vehicles. Project Better Place came out of stealth mode in October when it announced a $200 million first round of funding and in January said it was partnering with Renault-Nissan Alliance to mass-produce electric cars in Israel (see Bumpy Road Ahead for Project Better Place? and IN BRIEF: Startup Snags $200M for Electric-Vehicle Battery Leasing Program).